A symposium is being held this week in Jerusalem on “The Dead Sea Scrolls at Seventy: Clear a Path in the Wilderness.” The full program is here. The poster is here. Brad Gray investigates the geographical connection between the leper healings of Naaman and the 10 lepers in the latest episode of The Teaching Series. Ten students were killed by a flash flood when hiking in Nahal Tzafit this week. The Druze celebrated their annual pilgrimage to Jethro’s tomb in Galilee last week. Ferrell Jenkins has written about “the Great Rift” in preparation for a series of articles about the Aravah. His post includes several beautiful photos. Episode Five of Digging for Truth focuses on the recent excavations of Shiloh. The site and synagogue of Umm el-Qanatir in the Golan Heights are the subject of an article in Front Page Magazine. Timna and its copper mines are described by the BBC. Lyndelle Webster is profiled on the Azekah Expedition blog, and she recounts how her volunteer work changed her life direction. Israel’s Good Name shares his experience and photos from his visit to Ein Hemed. Wayne Stiles explains the geographical and theological significance of Kadesh Barnea. A German-Egyptian team has discovered thousands of fragments in old Heliopolis. Egyptian authorities have charged 70 archaeological inspectors and security officials with looting the site of Quesna. The March 2018 edition of the Newsletter of the Egyptian Ministry of Antiquities reports the latest inaugurations, repatriated antiquities, temporary exhibitions, meetings, projects, and more. Zahi Hawass is leading a crew of more than 100 Egyptian workers in excavating an area in the Valley of the Kings, but so far he is not revealing what he has found. The site of Mari has suffered severe destruction as a result of the conflicts in Syria. Carl Rasmussen shares photographs of the harbor of Troas where Paul set sail on his second missionary journey. The lead “Jordan Codices” have been proven to be forged. Margreet Steiner will be lecturing on April 23 at Tel Aviv University on “The Excavations at Khirbet al-Mudayna in Ancient Moab: Some Current Research Questions in Iron Age Archaeology.” The lecture will be held in the Gilman Building, Room 282 at 16:15. Funerary portrait sculptures, created in Palmyra, Syria between the 1st and 3rd centuries AD are on display at the Getty Villa until May 2019. Mosaics from Antioch on the Orontes were buried beneath the lawn of the Museum of Fine Arts in St. Petersburg, Florida, several decades ago and only recently uncovered. There is some new ancient world content in JStor. Accordance is now hosting “April Showers of Archaeology” and they have up to 50% off on all kinds of great resources, including the American Colony Collection, Archaeology of the Land of the Bible, Biblical Archaeology Review Archive, Bible Times PhotoMuseum, and more. David Gurevich considers the effects of re-dating Jerusalem’s Middle Bronze walls on our understanding of Jerusalem in the time of David and Solomon. Why do the locals of Jerusalem dump their trash everywhere? Wayne Stiles suggests some reasons and makes an application to our lives. Archaeologists have filed a petition against the Israel Antiquities Authority for its approval of the prayer platform below Robinson’s Arch. Scientists are studying dust deposits in the Jordan Valley in order to understand changes in landscape and climate in antiquity. 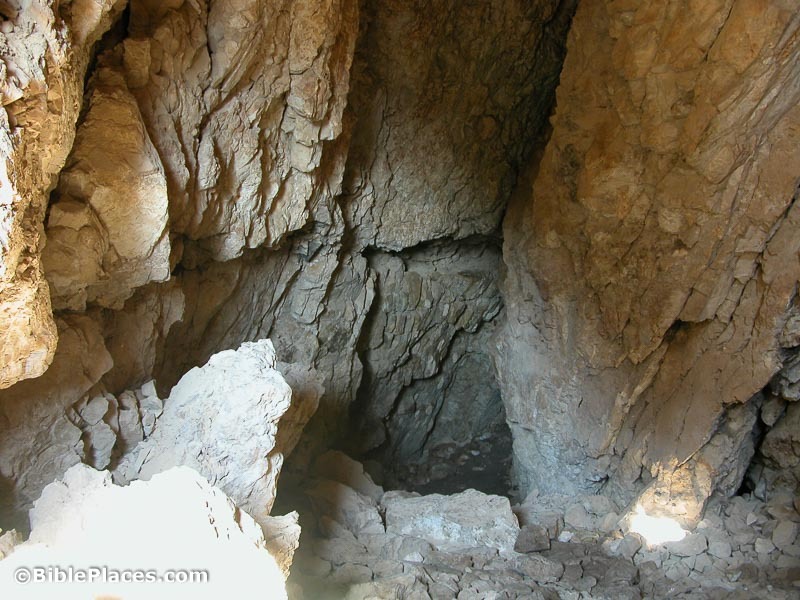 If you’ve hiked the Israel Trail and the Jordan Trail, you might want to consider the Sinai Trail (especially if you are brave). If you want to dig at one of the most exciting excavations in Israel, you need to get your app in now! 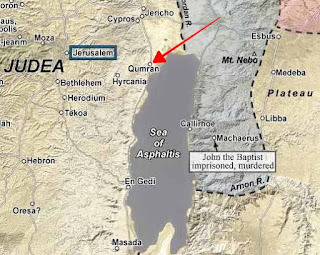 John DeLancey shares a video of the quiet Capernaum shoreline and explains the significance of the location. Tampa Bay Online runs an obituary for James F. Strange. Congratulations to Seth Rodriquez on his appointment to the faculty of Colorado Christian University! The text in Luke 3:3-6 speaks of the ministry of John the Baptist and makes reference to "the book of the words of Isaiah the prophet." Interestingly enough, we now have an actual ancient copy of the book of Isaiah referred to by Luke, which, having been penned in ca. 125 BC, was written prior to the time Luke wrote his work. This ancient text, commonly called the Great Isaiah Scroll, is a well-preserved copy of the Old Testament book of Isaiah. Further, this same scroll is featured in the Shrine of the Book at the Israel Museum in Jerusalem. The entire scroll is shown in the following photo, which can be seen in more detail by clicking to enlarge. Having been found in 1947, the Great Isaiah Scroll was one of the first of the Dead Sea Scrolls to be discovered, and—with the exception of some small damaged portions—it contains the entire text of the biblical book of Isaiah. Moreover, a handy digital version that scrolls electronically and has a translation app is now available to the public. 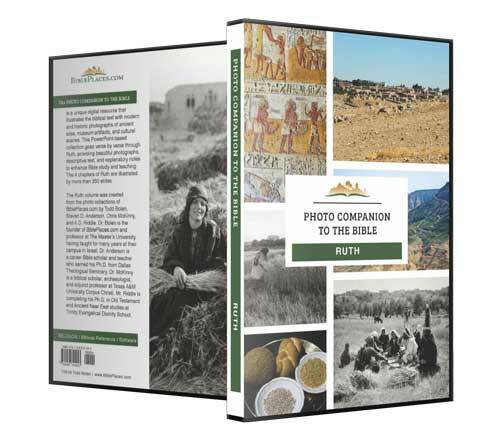 This digital version is part of the larger Digital Dead Sea Scrolls collection. The Dead Sea Scrolls, which contain nearly all of the Old Testament books plus a number of other ancient works, were found in caves located in the hills around the ancient community of Qumran, which is designated by the red arrow on the following map cropped from the Satellite Bible Atlas. 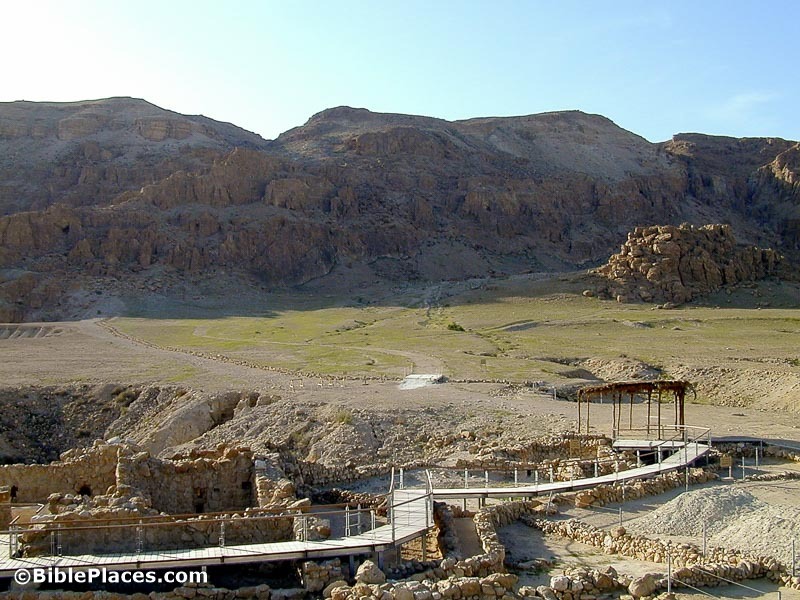 The following photo shows a general view of the slopes west of Qumran where some of the caves are located. The next photo shows the exterior of Cave 1 in which the Great Isaiah Scroll was found. This final photo displays the interior of Cave 1 in which the first seven scrolls, including the Isaiah Scroll, were discovered. 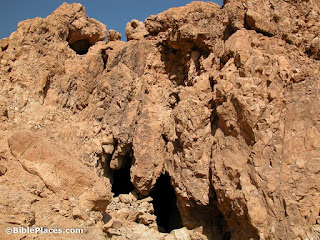 Commonly thought to be written between 200 BC and AD 70 by a group of Essenes inhabiting the community of Qumran, the Dead Sea Scrolls, including the Great Isaiah Scroll, represent a simply unrivaled collection of ancient biblical manuscripts. Further, though they do not deal with Jesus or the early Christians directly, they are a tangible remnant of the era during which Jesus lived.